For several years, those of us with concerns about housing affordability have been anticipating the granting of power by Queen’s Park to municipalities to force developers to include a proportion of new housing developments as affordable housing. Dubbed “inclusionary zoning” by the sector, it’s a potentially important way to address the shortage of affordable housing in Ottawa, and to mitigate the effect of gentrification in our most popular neighbourhoods. Kitchissippi is very much one of the city’s most popular neighbourhoods. Unfortunately, no matter how many times I read the proposed new inclusionary zoning rules, I can’t shake the belief that as set out for comment, the new rules will make fundamentally no difference at all to addressing our housing issues, at least in this ward. Before I delve into that, it’s worth looking quickly at some big-picture perspective on why we should care in Kitchissippi about inclusionary zoning. 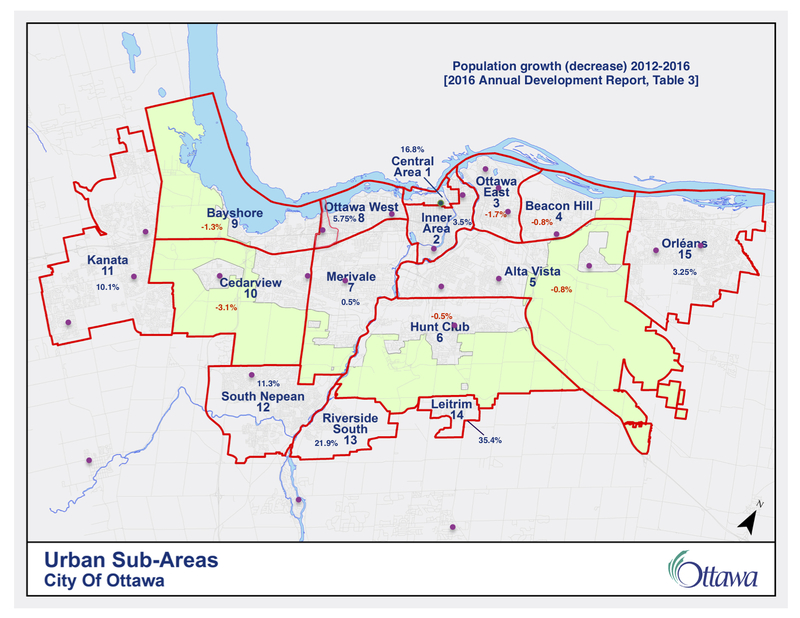 When we look at growth in Ottawa, it’s clear that much of it inside the Greenbelt is occurring in our ward, as demonstrated in the graphic that accompanies this post (click it to make it larger), which shows five-year population growth in the urban and suburban areas. Note that while the Merivale sub-area grew by .5%, that includes the Civic Hospital neighbourhood that is part of our ward, and it’s seen hundreds of new units built in very recent years (sub-areas don’t quite match ward boundaries. I’ve noted Sherbourne on the map as the line between Bay and Kitchissippi wards; east of Kirkwood, Carling constitutes our southern boundary). That growth, atypical in the past five years of areas inside the Greenbelt but outside the core, isn’t hard to understand. By the time Phase 2 of LRT is built, we’ll have five LRT stations serving Kitchissippi, and growth in Ottawa is being directed to these stations. Our two BIA traditional mainstreet areas are thriving regional destinations. The ward is characterized by relatively small homes on relatively large lots ripe for infill development and speculation. Streets such as Scott are characterized by very low heights not in keeping with the direction of our Official Plan adjacent to the new LRT. It all adds up to growth – and to much higher property values. Residents may recall my superficial look at the results of the recent property value re-evaluation by MPAC that saw hundreds of properties on dozens of streets in the ward rise by over 13.5% as a result of re-assessment (read that analysis here). We’re not alone. Across North America, communities like ours are gentrifying as there is a continent-wide shift back to urban living in response to local intensification regulations, and a new focus on public transit and cycling infrastructure. Unchecked, there will absolutely be a classic case of market failure in the making to ensure our community is affordable and diverse. Without intervention, it’s very likely that there will be no market affordable housing in Kitchissippi in the coming decades. While I worry about community capacity in a monolithically rich ward, more immediately our concern should be that those who can best benefit from access to LRT and walkable amenities will be pushed out. If only the comfortably-well-off can afford housing in proximity to transit, the advantage of building it is blunted. So, many of us enthusiastically greeted news that the Wynne government had forged ahead with the Promoting Affordable Housing Act, which received Royal Assent a year ago. And, we settled in to wait for the details of how that would be implemented. Affordability would be defined at a neighbourhood, not city-wide level. The basics of the rules are that cities would be required to set out in their Official Plans locations where inclusionary zoning rules would apply, be applicable to developments 20 units or over, max out at 5% of a development or 10% of a development in a transit-oriented demand area, set out a detailed and likely administratively complex housing plan, and guarantee that units would be affordable for at least 20 years, but for no more than 30 years. While the municipality would be required to subsidize the affordable units by 40% of their lost value (that is, 40% of the market price less affordable price for the sum of all units in the development), there is a recovery mechanism contemplated for that subsidy where the owner sells within 20 years of the first sale. If that second sale occurs within two years, 90% of any increase in price would accrue to the municipality. If the second sale occurs between 15-20 years of the first, 90% of the proceeds would accrue to the owner. The subsidy is probably the most onerous and developer-friendly part of the proposed new rules. Residents may recall that for the past several years, I and other councillors have expressed concerns that there is no municipal “top-up” anymore to the capital cost of building affordable housing. Other than waiving some fees, the $4 million that Council used to add to federal and provincial housing funds was finally eliminated last year, moved to the operational budget to deal with downloaded responsibility for inflationary pressure in social housing. In light of that reality, it is highly unlikely that municipalities will be able to fund the required subsidy in cash. There is the possibility, which I leave to experts to comment further on, that waiving development charges and cash-in-lieu of parkland fees could help subsidize at least some new affordable housing. However, those funds are critical to mitigating the effect of growth to begin with. Growth and intensification in Kitchissippi is creating pressure on soft and hard infrastructure such as the need for expanded and new recreation capacity, library space, stormwater management and transit service. Foregoing CIL or development charges would be perversely self-defeating. Even waiving those fees, however, I’m skeptical that cities could afford to subsidize the housing without a cash contribution. The subsidy could also be provided through reduced parking requirements. In our ward and others in close proximity to transit, however, parking requirements have largely already been reduced or eliminated already. It would be baldly cynical to re-introduce those requirements just to then have a way to pay for affordable housing – and it would be bad planning. In Kitchissippi, however, it’s unlikely we’d even get to the point of having a discussion about how to pay for inclusionary zoning since the exemption for rental housing eliminates the easiest and increasingly most prevalent form of high-rise building in the ward. Many of the recently-approved developments are proposed to be rentals (though those could be flipped to condos if the market ever comes back). And, many of the largest parcels will be developed by companies controlled by real estate income trusts (REITs) that rely on steady rental revenues to make distributions to unitholders. Besides sidelining what will almost certainly be a large part of new builds in the ward, we have already encountered difficulties around how to guarantee affordability in condo builds. While the proposed regulations make conceptual sense for new subdivisions of freehold units, we’ve struggled to find a way to apply affordable housing mechanisms apply to condos that have fees (sometimes very significant fees). I’ve listed the development of affordable housing guidelines on a more granular level than city-wide as a challenge. Truth be told, though, I’m not sure how that would work. On the face of it, it may mean that housing costs are calculated using an expanded definition that takes into account the higher taxes we pay in wards like Kitchissippi. However, I’m concerned that what’s considered affordable in a high-cost neighbourhood like ours might be different than in a lower-cost one. If that has the effect of further discouraging affordable housing in our ward, that would be a negative outcome. With all that said, I am still exploring what the proposed new rules mean, and how I will finally weigh in on them. There is the potential, for example, that some developments will not have an affordable housing component. Both Councillor McKenney and I have both directed some of the section 37 funds from some approved developments into an affordable housing fund for our respective wards, and those monies might be a way to subsidize the affordable housing in other developments. That’s a worthwhile exploration. I have reached out to colleagues and consider that we should begin formulating a City response to address some of the concerns that I and others have. Queen’s Park has opened comments until February 1, which gives us all some time to confirm or change our initial impressions of the proposed regulations – but not that much time. I encourage everyone interested in the subject to submit their comments using the instructions found through the link above. I’d welcome your comments on what you’ve read or are hearing about the proposed inclusionary zoning rules. As Kitchissippi continues to intensify and grow, that has positive and negative ramifications. The negative could potentially be mitigated by using inclusionary zoning tools – but only if those are carefully honed.